I was once having an imaginary conversation with a real friend, a political scientist, and trying to defend the value of novels, poetry, and plays. A sentence came into my mind -- I was pleased with it for a second. "Literature," I said, comparing it in my mind to various other disciplines, "doesn't pretend to have answers that it does not actually have." I checked myself, though, thinking of all the great works that would contradict this statement. It might not have been the most airtight aphorism, but while I was reading Orley Farm, it struck me as a good description of the appeal of Anthony Trollope's novels. "He confounds me with his mastery," Tolstoy once wrote of Trollope. It is a hard word to associate with Trollope's baggy, seemingly improvised books, with their repetitions and occasionally paint-by-numbers romances, but mastery it is to have to written so much and lied so little. In scene after scene of his novels, you think, "yes, that's the way it would go." And Trollope's people -- unlike, say, Dickens's -- always feel like they could have existed in the real world, rather than being brilliantly designed to produce an effect. [Trollope's novels] precisely suit my taste, -- solid and substantial, written on the strength of beef and through the inspiration of ale, and just as real as if some giant had hewn a great lump out of the earth and put it under a glass case, with all its inhabitants going about their daily business, and not suspecting that they were being made a show of. In Orley Farm, one feels that one is getting close to the actual lives of city lawyers in their chambers and commercial travelers selling their cheap iron furniture from door to door. Trollope, as he hews his lump out of Victorian society, can move between classes with no sense of strain, and also little sense of animus. When he does feel anger, as in the satirical chapters of The Way We Live Now, it tends to throw the book off track. He is a hard writer to point to when defending the dignity of literature. He has no social agenda and doesn't seem to care much for art as a form of spiritual transcendence. But he has another quality which is unusual in a novelist and seems to me to be rather noble: he respects the privacy of his characters. He refuses to wander through the private rooms of their minds, tracking down every last thought. 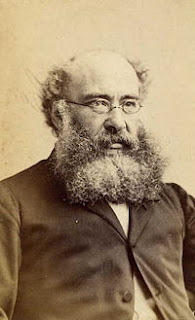 Even writing from an omniscient standpoint, one of Trollope's characteristic moves is to stop at a certain threshhold and declare that beyond this point he isn't sure what the character is thinking. "What the lady's intentions were I will not pretend to say..." he writes, in some form or another, every few chapters. It is a bizarre thing to say about a person that you have made up, whose thoughts, on other occasions, you have been quite willing to detail. Even when he writes "she thought," he is often prone to add a qualifier like "we must presume," as if there is a limit beyond which his knowledge does not go. Another of his strategies is to detail several possible states of mind, and then declare that the truth is some unknown admixture of all of them. Basically (and this is rare for writers) he has manners, and won't extract more knowledge from his characters than they want to give. Another way to say this is that he respects the central mystery of each person, and in this sense -- and probably only in this sense -- he strikes me as a spiritual writer. In Orley Farm, for example, which centers around the question of whether a will was forged by the widow of a dead landowner, he withholds a certain corner of a character's mind in a way that would be aggravating if he didn't also grant a similar margin to other characters: the attorneys on either side of the case, one in love with a judge's daughter, another infatuated with one of his clients; servants at various houses; a couple of witnesses -- one easily cowed by the crafty barristers, another not -- and a handful of gentry and commercial people who take sides with the various parties in the case. It is an enormous canvas; several characters are quite needlessly introduced, and then sketched in detail only to disappear. It is not, like Dickens, a beautiful pattern, but somehow I never complained while reading. Encountering the people is itself a pleasure, and you never know when Trollope will have them become part of the story again -- it often seems that he doesn't know himself, and simply calls them back on stage when he starts to miss them. One of the marks of his respect for characters is that he treats them like they are all living a life apart from the book they happen to be in. Even though he tends to write from a fairly fixed moral position, and is willing to declare that someone has acted badly, he never presumes (one of his favorite words) to make a final judgment on anyone. In short, he doesn't pretend to have answers that he doesn't actually have. This is one of the reasons that, unlike the other novels of his era, Trollope's retain their interest to the last page. Normally, when the main action has been settled, it is a bit of a slog to get through the chapters of family happiness and the sorting-out of fates. Trollope refuses to sort people out in this way; it would be akin to passing judgment on the rest of a character's life. People go on; even if their characters may incline them in certain directions, who knows what might happen to them next. Of her future life I will not venture to say anything. But no lesson is truer than that which teaches us to believe that God does temper the wind to the shorn lamb. To how many has it not seemed, at some one period of their lives, that all was over for them, and that to them in their afflictions there was nothing left but to die ... For Lady Mason let us hope that the day will come in which she also may once again trick her beams in some modest, unassuming way, and that for her the morning may even yet be sweet with a glad warmth. For us, here in these pages, it must be sufficient to say this last kindly farewell. Let us hope. This is the broad-minded note that Trollope's novels tend to strike, even with their villains. They are wonderful, generous books. Orley Farm was apparently one of Trollope's personal favorites, and along with The Way We Live Now is probably the best of his free-standing novels. I still have several of the Barchester and Pallister novels ahead of me, and am perfectly content that Trollope woke up religiously every morning and kept his pen moving.